It feels like an age ago when I posted the first chapter of NEW DAWN. It probably was. And now it’s finished. I want to start this post by saying thank you to everyone who joined me on the journey from the very beginnings of NEW DAWN, for the comments, well-wishes and advice given by all of you to make NEW DAWN what it is today. As much as an experience as it was for Jake on board the Athena, it has been for me in writing it, and it wouldn’t be what it is today without all your input, so thank you. So I guess the big news is that NEW DAWN is going to hit Amazon on the 16th of February, 2016 at a launch price of 99p/99c. With all your comments, plus assistance from a few key people here, NEW DAWN has taken shape from the first draft presented to you on this blog to the final work due to be released shortly. I think you’ll all enjoy where the story has gone—needless to say, it has changed dramatically in some parts—and I hope that it has made the experience all the more rewarding for you as readers. I hope you’ve enjoyed this journey from concept to publication as much as I have, and again I want to thank you for joining me on it. 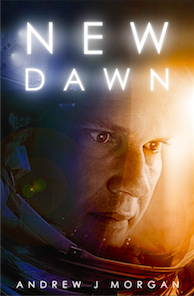 When NEW DAWN appears in all its finished glory, I would be immensely grateful if you could grab a copy, leave a review, and tell your friends and family to do the same. Once again, thank you to all of you. Between now and the launch, I’ll be posting updates about the publication process, and from there—who knows. I have a few ideas up my sleeve that I think you’ll like. Thank you! I’ve been working on it for a few months now. Hopefully it does the trick! Thanks for sharing…and much looking forward to the release this coming Feb. 16! I know you will send us a reminder of the release date so we do not miss it! !